With its open-armed energy and elegiac grace, “AUGUSTINES” marks a colossal leap forward for Votiv/Oxcart recording group Augustines – no mean feat considering the extraordinary power of their breakthrough 2011 debut, “RISE YE SUNKEN SHIPS.” Songs like “Now You Are Free” and the plaintive “Walkabout” are both immediate and engaging, joining joyously unrestrained arrangements with singer/guitarist Billy McCarthy’s signature affective lyricism. “AUGUSTINES” marks a milestone on Augustines’ amazing journey, the work of a gifted band ascending to new heights while simultaneously grappling with their place in the universe. 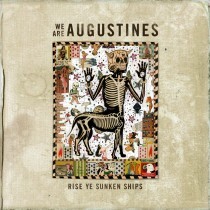 “RISE YE SUNKEN SHIPS” – recorded and mixed by Dave Newfeld (Broken Social Scene, Super Furry Animals) – instantly set Augustines among modern music’s most compelling new bands. Songs like “Juarez” and “Book of James” touched a collective nerve, their dark subject matter refracted and then elevated by Augustines’ affirmative approach. Hailed by iTunes as 2011’s “Best Alternative Album,” “RISE YE SUNKEN SHIPS” was a critical and popular sensation, earning abundant praise and a fervent fan following. McCarthy and Sanderson enlisted the talents of British-born, conservatory-trained drummer Rob Allen and with that, Augustines became a fully-fledged band. The trio traveled the planet, performing innumerable headline shows, support sets, and show-stealing festival dates. By the end, Augustines felt akin to Archibald MacNeal Willard’s “The Spirit of ’76,” bloodied but unbowed as they marched home from their long campaign. They paused to heal their dents and dings, with McCarthy embarking on an extended expedition that saw him visit such far-flung locales as Kenya, Turkey, Mexico, and Alaska. He eventually drifted back to the Applegate, California elementary school where he first learned an instrument. There he worked, observed by students and faculty as he put fingers on strings and pen to paper. Meanwhile, Sanderson and Allen worked on demos of their own, each still abuzz with ideas and experiences garnered on the infinite tour. In late November 2012, Augustines reconvened for a month of woodshedding at Temperamental Recordings, a converted 19th century country church in Geneseo, New York. Fully armed, Augustines next headed to Bridgeport, Connecticut to record with co-producer Peter Katis at his residential Tarquin Studios. Katis (The National, Frightened Rabbit, Interpol, and – most importantly to Augustines – Jónsi) proved the ideal collaborator, helping focus the band’s driven pace and ample vision. From the start, the sessions evinced a decidedly more optimistic point of view that the one which fired their heartrending debut, with songs like “Nothing To Lose But Your Head” and the buoyant “Kid, You’re On Your Own” lit by positive vibrations and striking confidence. Where their first record was created in relative isolation, “AUGUSTINES” was made “with the awareness that we weren’t going to be alone anymore,” says McCarthy. “This is us handing it over to those people that sang our songs back to us all over the world. Indeed, tracks like the thundering “Cruel City” and the album-closing “Hold Onto Anything” demonstrate a distinctly outward shift in sonic scope, interpolating the holistic experience of West African music into Augustines’ sweeping, multi-faceted sound. Augustines are eager to bring their brilliant new album to a worldwide audience keen for their return. If “RISE YE SUNKEN SHIPS” provided much needed catharsis, “AUGUSTINES” now takes this very special band to an altogether new plane, transcendent and triumphant.